Producing the 2nd fastest time of her young career, Italian 23-year-old Margherita Panziera powered her way to 200m backstroke gold here in Madrid on the final night of the 2019 Open Absoluto Invierno Comunidad de Madrid. Opening with a front half of 1:02.41 and closing in 1:04.71, Panziera’s the checked in at a monstrous 2:07.12, sitting 2nd in her career’s resume only to her personal best mark of 2:06.18 hit at Glasgow last year for European Championships gold. Panziera’s outing surges the Italian to the top of the overall world rankings for the season, dethroning American teen Regan Smith. Also shaking up the world rankings was Panziera’s Italian teammate Simona Quadarella, as the multi-European Championships gold medalist hit her season-best time in the women’s 400m free. Touching the wall in 4;07.88, Quadarella produced the 5th fastest time of her career and the 7th fastest time in the world this season. Keeping the Italian winning streak alive in Madrid was Santo Condorelli, the once-American/once-Canadian swimmer who notched the fastest 100m butterfly time for the men this evening. Condorelli punched the clock in 52.28 to beat out teammate Piero Codia‘s silver medal-garnering time of 52.45. Condorelli’s effort falls within the top 12 outings in the world this season and represents the Olympian’s fastest time since 2016. 4-time European Championships medalist last year, including a silver medalist in the 100m fly, Russian Svetlana Chimrova got the job done in the sprint event tonight in Madrid. Clocking a winning mark of 57.88 for the only sub-58 second time of the field, Chimrova nailed her fastest time of the season and came within less than a second off of her own Russian National Record of 57.17. Chimrova’s remarkable time this evening now enters the Russian as 5th in the season’s world rankings. Of note, Elena Di Liddo put up a solid performance of her own for silver, finishing in 58.57. 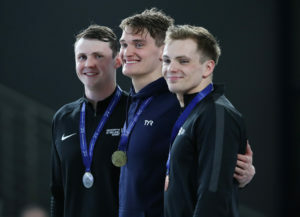 Andrea Vergani took the men’s 50m free in 22.02 to position himself as the 4th fastest swimmer in the world this season. He registered an eye-popping effort of 21.68 last summer to take bronze at the European Championships. Luca Dotto settled for silver tonight in 22.43, while Condorelli took bronze in 22.56. Miguel Duran was the men’s 400m free winner in 3:50.35, with the 200m freestyle victor here, Matteo Ciampi, right behind in 3:50.47 for silver. Silvia Di Pietro and Barbora Seemanova tied for the women’s 50m free gold. Both touched in 22.74. Seemanova was back in the pool to take bronze in that women’s 400m free race behind Quadarella and Italian Linda Campioni. Campioni earned silver in 4;09.19, while the Czech clocked 4:14.38. FYI Andrea Vergani swam an even more impressive 50 freestyle in semi-final in Augist at Glasgow duing European Championship: 21”37 obviously current Italian Record.